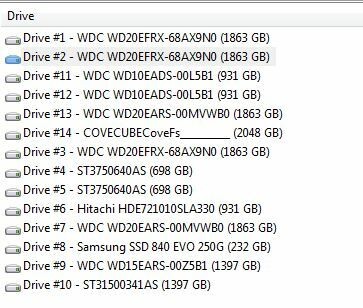 So, I have an issue with having lots of hard drives and not being able to tell which one is which. For example, I have 12 hard drives, many are the same make and model and size. I am unable to tell which one is which looking at AIDA64 storage reports. The only uniquely identifying attribute as far as I can tell is the serial number found in the ATA report. However, this report does not tell me which logical drive this serial number is attached to. Is there a way we can add a column on the logical drive report that has the physical hard drive serial number? Or a column on the physical drive report that includes the serial number and the logical volume letter? Or maybe a new report that has the combined column fields so that the physical and logical attributes are together on one page so that the drives can be easily identified? I attached a screenshot of what I mean. Drive 1, 2, and 3 are the same, can't tell which one is which as far as which one is drive F: and which one is drive G:, etc. Samething for drives 11 and 12, 4 and 5, and so on. Forgot to mention that this also makes matching the sensor with the drive letter impossible for me. Please don't forget about this issue, I can't be the only one that finds this frustrating. Does anyone know if Windows 10 will enable AIDA64 to solve this problem of associating logical and physical hard drives in a reliable way? AFAIK Windows 10 will not revamp the storage subsystem, so no, I don't think it would help. While most programs allow the user to select the speed measured in X, GoldWave only accepts values in KB/S. When I go to Storage\Optical Drives page in AIDA64, the speeds both for reading and writing are given in X. What calculation should I make to get an aproximate value for the X speed in KB/S? I think there is a rule of three whose unit (such as 1024 for measuring memory) I'm missing.